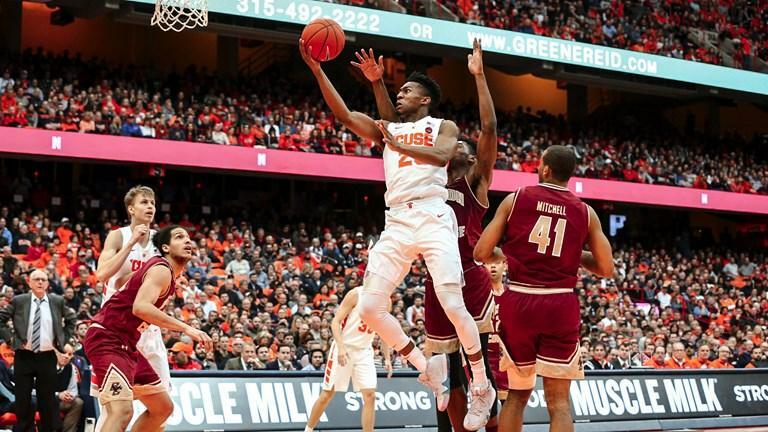 With just over nine minutes remaining in the game, Tyus Battle stole the ball, ran the length of the floor, and rose up for a dunk, brining the Carrier Dome crowd of over 26,000 to its feet. Boston College's Ky Bowman matched Battle almost the entire way down court, but could not catch up to prevent the jam. Reporter Justin Paura joins hosts Max Chadwick and Aodhan Doyle to discuss what Jim Boeheim said after the win over Boston College. The game remained close in the first half, as neither team led by double digits until a 31-21 SU lead with 1:21 left. Syracuse carried that lead into the second half, and it grew to as large as 20 with 8:15 remaining in the game. However, the Eagles then went on a 14-0 run, puntacted by a Ky Bowman three-pointer, to bring it to 60-54 with 3:54 to play. The Orange responded by stifling BC's offense, allowing only one more score the rest of the game. Outside of Tyus Battle, Syracuse received a huge boost from Buddy Boeheim career high 16 points on 4-5 shooting from beyond the arc. Boeheim bounced back from an 0-6 night from three in Syracuse's previous loss to Florida State. His shooting ability opens up the floor for SU's offense and has earned him double-digit minutes in seven of the past nine games. Coach Jim Boeheim opened up his post game press conference praising the defensive intensity of Marek Dolezaj, who racked up four steals and two blocks. Dolezaj contributed offensively as well with 7 points on 1-2 from three, along with three assists. Boston College kept themselves in the game by hauling in 15 offensive rebounds, but shot only 33.3% from the field. Syracuse scored 25 points off 18 caused turnovers. With 12 points and 12 rebounds, Oshae Brissett recorded his third straight double-double and his sixth of the season. Syracuse continues ACC play with a matchup against Louisville on Wednesday night. Tune in to 88.3 FM or WAER.org starting at 6:30 for Countdown to Tip Off right up until the 7:00 start.